A popular restaurant, housed in an unusual former bank building close to Beckenham Junction station. Mae Ping has a warm and inviting atmosphere and the authentic feel of Thailand – as if you were sitting in a friendly restaurant in Chiang Mai where the river “Mae Ping” runs through. There is an extensive selection of dishes on the menu and carefully selected fresh ingredients include such Thai staples as chillies, lemon grass, basil and kaffir lime leaves, making dining at Mae Ping a special culinary delight. Open every day (except Mon lunch) noon-2.30pm and 6-11.30pm. All major credit cards accepted. 10% service charge. 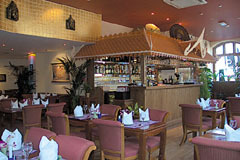 Click on the web link underneath our address details to view our sister restaurant in Croydon.